Airframes are designed to deflect in response to aerodynamic and gravitational loads during flight. 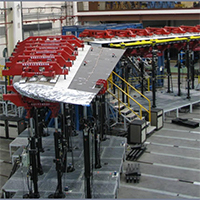 These deflections in turn load the mechanisms riding on the airframe that move the primary flight control surfaces to maneuver the aircraft. The airframe manufacturer must ensure that deflections of these mechanisms at any point in the flight envelope do not affect their operation. For example, the Airbus A400M elevator is connected to the horizontal tail plane (HTP) with eight hinges that form a straight line when the wing is undeformed. Seven of these hinges are floating hinges which can float in the hinge line direction. When the HTP structure is loaded, it deforms, deforming the hinge line. The multi body simulation (MBS) model here shows the location of hinge 7 which is used to move the elevator, and the drawing below the model shows a cross-section of the hinge. The gap g2 in the drawing allows the red lug to slide on the green pin. ”The replacement of the physical A350- 1000 wing bending test with simulation of the effects of deflection on the flight controls saved Airbus about €3 million and 4 months on the certification process for the A350,” said Michael Vetter, Project Leader Multi-Body Simulation with Airbus. Most of these savings were achieved by eliminating the need to build test fixtures. Similar savings will be achieved for each future aircraft model. Airbus engineers are also working to apply this same method to other mechanical systems of the aircraft such as landing gear and passenger doors.